80 percent of gold is used to make jewelry. Is your gold ring really worth its weight in gold? When experts include the risks to the environment and the people living near mine operations, some say no. A look at the hidden toxic costs of gold mining. Modern-day gold-mining techniques bear little resemblance to early Gold Rush days, when prospectors arrived with pans and pick axes in search of gold. Today most mining operations use a process called heap-leaching, where gold is chemically sifted from huge piles of low-grade ore using a water-based sodium cyanide solution. To get a sense of the scale of the process, at the Yanacocha mine in Peru for example, Newmont Mining must extract and leach approximately 30 tons of dirt and rock to recover just one ounce of gold. The fact that mining companies are willing to go these efforts for such small returns is a fairly good sign that the gradual depletion of high-grade ore deposits around the world hasn't deterred the perpetual lust for gold. Nor, apparently, has the environmental damage caused by gold mining reduced the demand for jewelry, which accounts for 80 percent of gold produced today. Once the cyanide is trickled over the ore, it dissolves and separates the gold, which is then pumped to a refinery and recovered, along with by-products including silver, platinum and mercury. The cyanide solution is stored in ponds with impermeable liners and recycled for more processing. Source: GFMS Ltd., an international precious metals research firm in the U.K. Industrywide, one of biggest environmental challenges is safely storing the cyanide solution in these ponds without accidental leakage, said Micheal George, a gold commodities specialist with United States Geological Survey (USGS). "Most of these liners are quite complex," said George. "But if your liner is compromised in some way -- well, communities are worried." Although there are alternatives to extracting gold from low-grade ore, for decades the gold-mining industry has preferred to use cyanide -- one of the deadliest toxins in the world. "It's cheap and it works," said Paul Robinson, research director at the Southwest Research and Information Center (SRIC) in Albuquerque, New Mexico. According to the International Cyanide Management Institute (ICMI), alternative chemicals are generally more expensive to use and also present risks to health and the environment that are similar to or greater than that presented by cyanide. The group says the industry continues to search for cost-effective and environmentally friendly alternatives to cyanide. In an interview with FRONTLINE/World, Brant Hinze, general manager of Newmont's Yanacocha mine in Peru, explained that Newmont's management of cyanide "is state of the art." Hinze asserted that the mining company has a financial incentive not only "to protect the environment but to maximize our profit…managed not just to industry standards but exceeding industry standards." But "industry standards" vary from place to place, according to environmentalists like Payal Sampat, international campaign director for Earthworks, a non-profit organization which tracks the impact of mining worldwide. "Ocean dumping of mine waste is banned in the United States," she said, "but allowed in other countries. There's no global watchdog body." * Includes jewelry, electronics, dental materials, coins, medals, and other industrial and decorative fabrication. Source and copyright owner: GFMS Ltd., an international precious metals research firm in the U.K. Source and copyright owner: GFMS Ltd., an international precious metals research firm in the U.K. The majority of mining companies pledge to adhere to U.S. environmental standards when they operate overseas. But some industry experts have concerns about the impact of chemicals used in mining. They point out that heap leaching not only consumes huge amounts of fresh water but generates highly toxic byproducts, including mercury and arsenic. "There's not a mine company out there that's going to tell you how much mercury they process," said Earl Brooks, a USGS mercury commodities specialist. "It's an environmental pariah." Today, there are a growing number of codes of conduct and voluntary initiatives in which gold producers are involved. But experts say making sure these codes are adhered to is a concern. "The biggest issue," said Robert Moran, an independent consultant of hydrogeology and geochemistry to NGOs and others in Denver, Colorado, "is that there's not any real enforcement" of environmental laws in developing countries. Moran suggests mining companies include environmental liabilities in their presentations to investors, including making financial assurances -- putting up a bond or insurance to cover environmental cleanup costs later on -- so that investors understand the real costs of doing business. "Given what I normally see at developing world project sites," Moran said, "many of the actual socioeconomic and environmental impacts long-term simply are not evaluated in [environmental impact study] processes -- hence, in the words of an economist, they are externalized. Another way to say this is that the poor are being asked to subsidize the rich." As the National Mining Association's Responsiblegold.org Web site, launched in October 2005, points out gold mining provides important export revenue for developing countries and provides royalty and tax income to governments and skilled employment and training for local populations. But as in most extractable industries, accidents occur. Those connected with gold mining operations have led to a number of major environmental controversies around the world. Measurements are in tons. Source: International Monetary Fund International Financial Statistics (IFS), August 2005 edition, for holdings through June 2005. On June 2, 2000, a Newmont contractor in Peru accidentally spilled 330 pounds of mercury along a 25-mile stretch of the Pan American Highway, most of it in and around the tiny village of Choropampa. The elemental mercury, or "quicksilver," a by-product of the mining process, was to be transported from the Yanacocha gold mine and sold in Lima for use in medical instrumentation and industrial applications. The SRIC's Robinson calls mercury "the plutonium of non-reactive metals" because of its toxicity. The amount that spilled in Peru is "enormous in terms of lethal and toxic doses," he said. "And very difficult to recover." Fortunately, more than 94 percent of the mercury spilt was successfully recovered, according to a report issued by the company. Villagers, particularly children, were attracted to what looked like "a liquid mirror," and collected the substance using empty soda bottles and their bare hands. Since the spill more than a thousand villagers have gone to local clinics and reported symptoms of mercury poisoning. Newmont made a multimillion-dollar clean up of the site, including health care for those affected. According to Ken Crowder, the Los Angeles based attorney representing some 1,000 area villagers in a civil suit against Newmont, the health effects may last years. Buyat Bay in Indonesia has been at the center of an ongoing controversy over whether Newmont should be held liable for gold-mining operations that villagers believe polluted their area and caused serious illnesses. Residents say they have suffered from mysterious rashes, growths and other ailments since the mine began production in 1996. Aided by environmentalists, they brought a suit against Newmont, which they accused of dumping mercury and arsenic into the bay. Newmont does not deny dumping mine waste but argued that it obtained the necessary permits, and that the waste did not pollute the waters or affect the health of the local population. "We were well below any Indonesian standards and well below any U.S. Environmental Protection standards," Wayne Murdy, the company's chief executive officer, told the Associated Press. "We have an excellent environmental record worldwide." However, in the same Associated Press report, an EPA staff member called Newmont's admitted release of 33 tons of mercury into the air and water over several years at the gold mine "a major concern." Studies by various organizations have reached contradictory conclusions about the impact of the dumping: The World Health Organization and an initial Indonesian Ministry of Environment report found the water unpolluted. But a subsequent ministry study found arsenic levels in the seabed were 100 times higher at the waste-dumping site than in other parts of the bay. 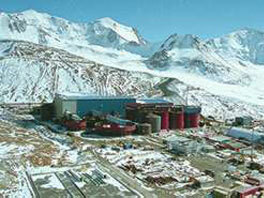 Newmont finished extracting ore from its mine near Buyat Bay in 2001, and processed the materials until 2004. But legal and public-relations battles still continue to rage. The New York Times revealed a 2001 internal company memo from Newmont's then-chief administrative officer Lawrence Kurlander, admonishing his colleagues for failing to uphold environmental standards at Newmont's operations in Indonesia. In January 2000, a large pond built to hold waste at a gold mining complex near Baia Mare, Romania burst through its walls and dumped 100,000 cubic meters ofmine waste into the Lapus and Somes Rivers. The owner, Aurul Gold, was a joint venture between Romania and Esmeralda Explorations, an Australian company. According to the New York Times, tons of cyanide-laden waters entered a creek from the Aurul gold mine and then poisoned three Balkan rivers and the Danube. The pollution killed fish and other wildlife and temporarily ruined water supplies for river communities. The Tisza River was also badly polluted. As a result of this spill and others, in May 2000 a voluntary code called the International Cyanide Code was set up under the auspices of the United Nations Environment Programme (UNEP) and the International Council on Metals & the Environment (ICME) to improve the management of cyanide at gold mines. The development of the Code was funded exclusively from the gold mining industry, cyanide suppliers and manufacturers. On May 20, 1998, a truck carrying sodium cyanide to the Kumtor gold mining complex in Kyrgyzstan accidentally overturned and spilled more than 1.5 tons of the poison into the Barskaun River, which drains into a nearby lake. The gold mine, the largest gold mine operated in Central Asia by a Western-based company was a joint venture between Kyrgyzstan and Cameco Corporation, a Canadian firm. In the days following, a reported 2,500 people were thought to have been poisoned, with more than 800 hospitalized. Following the spill, protestors blocked a road leading to the mine. The mine later paid $4.6 million in damages, and created a revised emergency response plan. In March of 2000, a 1-ton bale of concentrated cyanide accidentally fell from a helicopter into a deep forest in Papua New Guinea on its way to the Tolukuma gold mine. The mine, which was then owned by Dome Resources, an Australian firm, is so remote that it can only be reached by air, and all supplies, including cyanide, have to be flown in. The wood box holding the cyanide cracked open when it struck the ground, scattering the pellets containing the chemical. Local inhabitants were warned to temporarily stay away from the water. Most of the cyanide was recovered quickly. Critics accused the Australian company of having insufficient measures to safeguard against such an incident, charges the company denied. Chad Heeter is a freelance journalist from Lee's Summit, Mo. He is currently completing a master's degree in Latin American Studies at UC Berkeley. Dave Tuller is a journalist based in San Francisco who frequently covers health issues for the New York Times and other publications.